So I was passing by the downtown library ... when I saw ropes dangling down and people looking up. I had no idea what it was at first, but it's times like these I'm glad to have the camera handy. Two women in were perched near the top - dressed like colourful parrots or something - seemingly getting ready to rapel down the face of the building. 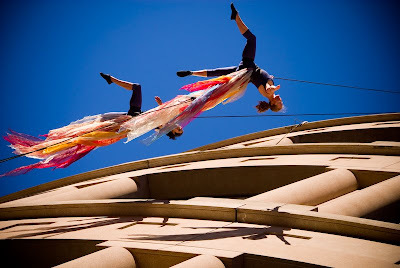 It turned out to be more like an aerial dance, with the performers pushing away from the wall, spinning upside down and doing various maneuvers in tandem. It was pretty mesmerizing, but drawing curiously little attention from passerby. There were no signs or anything announcing or explaining the performance, so it felt almost like an impromptu stunt rather than performance art. I didn't know how long it would last, so I made full use of my D200's 5fps for the first time in a long while! "Cumulus explores the territory of daydreams -- humans evoking cloud-forms migrating across the sky, celestial creatures morphing on the wings of the wind." It lists the performers as Alisoun Payne & Julia Taffe (also the choreographer). Anyways, just a random bit of coolness to the daily walk.